TDC for #1. It only locks in one way, right? on the fly wheel that aligns with the center of the case halves. And, I can see in the spark plug hole that the piston for #1 is TDC, and valves are both closed. I have engine out of the car, chasing a small oil leak, and to adjust valves and figured I'd double check dist. while easy to get to. It's a carb engine and was running o.k., with less than 1,000 mi. on rebuild and I'm still getting it sorted and dialed in. Had it timed for full adv. at 3200 rpm. I've got three different distributors and they all line up rotor wise, same position for #1. What distributor do you have? It is not always the same rotor orientation. With the fan at TDC is the rotor pointing to the #1 plus wire on the cap? The distributor gear can be re-clocked to get it into the adjustable range. I swapped from a 009 to a stock FI distributor and found this out. have you checked # 1 piston is at tdc,looks like you are 1 cyl out. I can see #1's piston is at TDC thru spark plug hole, after watching intake valve close, and before exhaust opens. Love when it's a simple fix. If you rotate it 180 degrees, you'll still be 90 off. 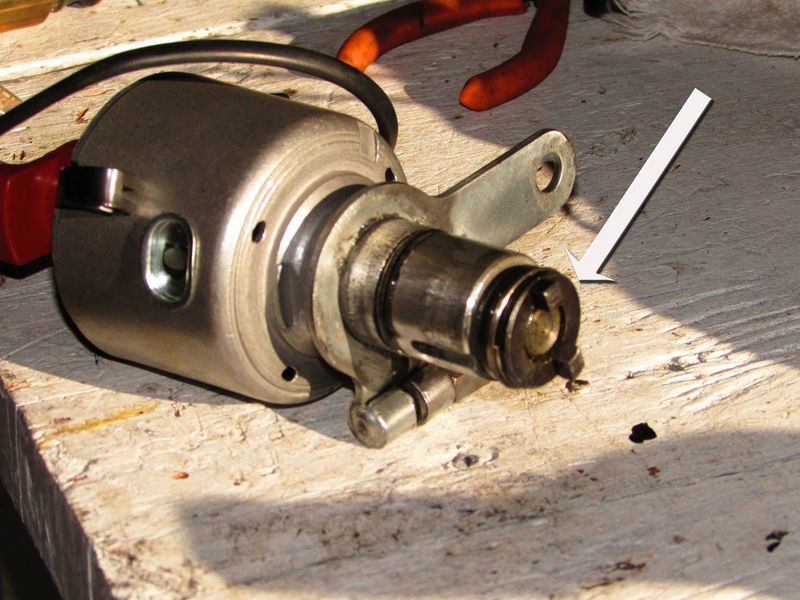 The way to fix this would be to pull the distributor driveshaft out, re-clock it, then re-install. Be very careful of the washer on the bottom of the driveshaft; if you let it fall into the engine you will be very unhappy. I'm not sure it makes much difference where exactly the #1 TDC position is, though. 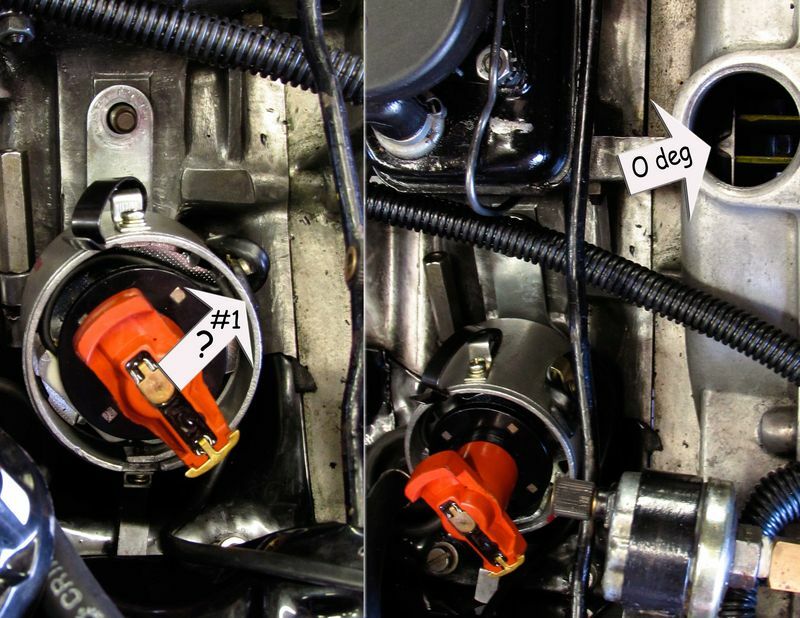 As long as nothing on the distributor fouls on any of the surrounding bits (the stock distributor's vacuum dashpot can hit the oil filler tower or the intake plenum) and you have the plug wires in the right place relative to that #3 position, it shouldn't matter. Why it was running o.k. As usual, just making work for myself. Had a suspicion it didn't really matter as long as firing order was correct. Pulling the drive is too scary for me anyway,ask me how I know??? ?,no I didn't drop a shim but very close. The OP has established #1 @ TDC and checked the valves so all is well,as DD pointed out turn the dizzy until you have your mark lined up and bingo you should be there,if something otherwise wrong it won't run.